When it comes to children’s birthday parties, I confess that I am a bit of a curmudgeon. I love the idea of two hours of fun, but in my ideal world we’d eliminate the party gifts and goody bags. I have a hard time understanding the need for gifts, where so many of us blessedly have too much as it is. My kids do not lack for toys, nor do their friends. And as for goody bags–really, what is the purpose of giving them? Especially since we usually fill them with cheaply manufactured tchotchkes that are tossed, lost or broken by day’s end. Imagine the reduced environmental blight if we eliminated goody bags entirely. However, until my miserly ideals catch on, I live in a world with birthday party gifts and goody bags. And, while we’ve gotten the goody bag gift down to a science (we gave away soap one year–I mean, who can’t use soap? ), we’ve also made the experience of receiving gifts a more thoughtful one for our children. 1. The birthday child may open only one gift per day. As I’ve learned, this doesn’t stop the birthday child from looking at unwrapped gifts in gift bags, but that’s OK.
2. The birthday child should write a thoughtful thank you note that same day or, at the latest, the very next day. In our family, an acceptable note thanks the gift giver for attending the party, thanks her for the gift, conveys enthusiasm for the gift and thanks the child for her friendship. 3. If the next day dawns without a note for the previous day’s gift, the birthday child may open a new gift only after she writes yesterday’s thank you note. These rules have many benefits. They help the birthday child to enjoy and appreciate each gift, without feeling overwhelmed by too many gifts opened simultaneously. The joy of savoring is something we tend to overlook these days, with so much emphasis on fast, big and many. Moreover, the birthday child is more likely to write a thoughtful note expressing real gratitude when she knows there is only one to write each day. As an added plus, slowing down the pace of opening gifts enables the birthday child to extend her celebration far beyond the big day. Because we set these limits when our children were young, we haven’t had any push-back (yet). 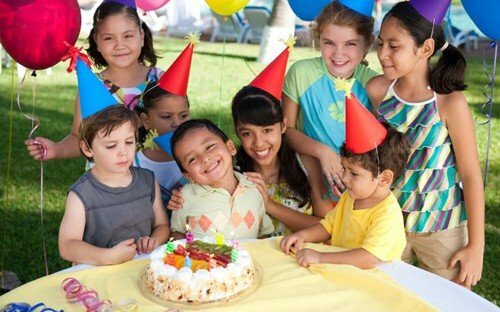 They know to be thankful that we continue to throw birthday parties for them and that we are willing to invite a large number of friends. We don’t skimp on the fun–my daughter’s circus-themed party this year was a big hit with her friends–and I know our children appreciate that. Birthdays are a big deal for our kids. While the emphasis is on enjoyment, I’m glad we’ve decided to help them savor the joy with a few limits intended to make these celebrations of life and friendship all the more meaningful and memorable. Rinny Yourman, a parent educator in training, has served on PEP’s board of directors. So thoughtful of you to take the time to comment and we’re pleased that the article resonated with you!